3D Bookshelf is a $1 app that you really can very nearly judge by its cover—or at least its name. The iPhone and iPod touch offering from Ideal Binary is an e-reading app that comes bundled with more than 30 classics—and it presents those books in a three-dimensional view. Turn the Page: Flipping pages in 3D Bookshelf shows off the app’s three-dimensional effects, but they’re diminished somewhat by the app’s portrait-only layout. If you enjoy the writings of Arthur Conan Doyle, Edgar Allen Poe, and Jane Austen, and you’re also a sucker for 3D, then yes, this is indeed the app for you. The rest of us, though, might believe instead that e-reading doesn’t really need a third dimension to satisfy. Visually, 3D Bookshelf does indeed pull of its titular look successfully. 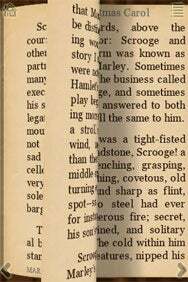 The words in the book curve around the page, almost blurring at the rounded edge. Page turn animations are undeniably slick. And the app even provides paper fluttering sound effects. But 3D Bookshelf tries a bit too hard. To keep its 3D motif alive, the app shows you the book with facing pages—or, at least, it tries to. While iBooks shows facing pages only in landscape mode, 3D Bookshelf works exclusively in portrait, and thus can’t fit both facing pages on the screen at once. So when you’re viewing the left-hand page and swipe to turn, your view pans over to the right-hand page. Swiping on that page actually turns the page. That’s fine, in theory, but when you turn to an intentionally-blank page, it gets a bit odd. You can choose to leave the default text option of dark text on sepia-toned virtual pages, or invert the colors. You can’t, however, adjust the font, its size, or the line-spacing, none of which are to my liking. I’d rather read in the Kindle or iBooks apps, myself. 3D reading ends up exactly as unnecessary as I’d expected.